Flowers adorn the grave of Zona Heaster Shue, legendarily known as the Greenbrier Ghost. 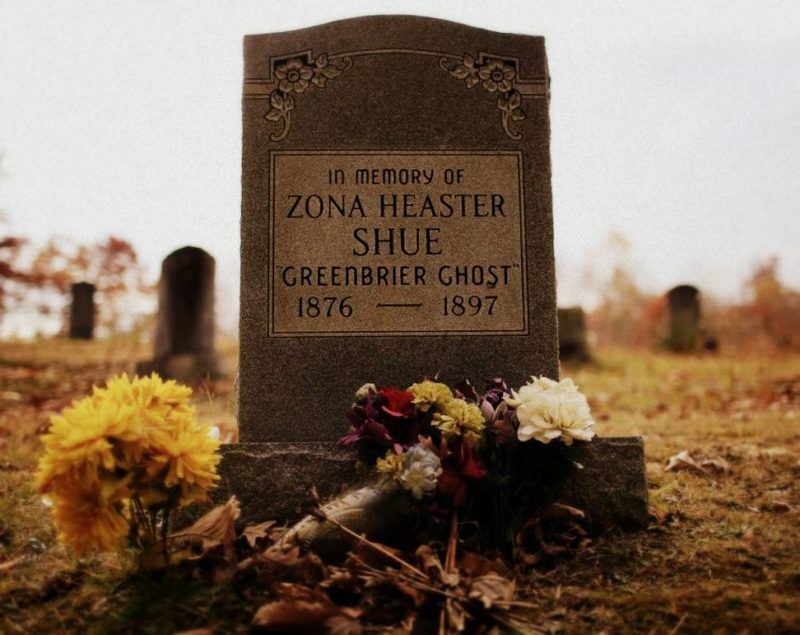 Officials at the Greenbrier Valley Brewing Company announced today the unveiling of a new beer created in honor of the legendary ghost of Zona Heaster Shue, the “Greenbrier Ghost,” testimony about which led to a murder conviction in 1897. Zona’s Revenge Wit, a wheat-based beer, or witbier, is the fourth beer the brewery has named after a legendary West Virginia character and is scheduled to be released selectively this week, according to Lisa Stansell, marketing director for the brewery. The brewery has heretofore also created beverages named for Bigfoot, Mothman, and Devil Anse Hatfield, all of which play a lead role in West Virginia lore. Stansell said the decision to honor Shue derived as much from the need to honor a legendary heroine as the chance to focus on a chapter in Greenbrier Valley history. “We wanted to honor a female legend with our new flagship, and, while there are many to chose from, we chose Zona Heaster Shue in order to highlight our own back yard of Greenbrier County,” Stansell explained. Shue was found dead on the stairs of her home in rural Greenbrer County, ostensibly from natural causes. However, her mother revealed soon after that Zona’s ghost had appeared at her bedside and revealed that her neck had been broken by her husband, Edward “Trout” Shue. Her body was exhumed, an autopsy was performed, and it was determined that her neck had indeed been broken. Trout Shue was found guilty of with the murder and remanded to the W.Va. Penitentiary at Moundsville, where he later died. Stansell said the new beer was designed to have year-round appeal and possesses an alcohol volume of 5.2 percent and an international bitterness unit of 20. The wit will be available at the French Goat Beer-in-the-Garden event on May 17 in Lewisburg, at Timothy’s at the Quarrier Diner on May 18 in Charleston, and at the brewery in Maxwelton on May 20 and again at the brewery’s cheese pairing on May 21.